The approach from Bali to Flores is a flip-book of natural spectacles. Volcanoes alternate with green hills, emerald bays with steep cliffs and the million fold blue gradations of the Indian Ocean. When you fly from Bali with Garuda Indonesia to Flores, you will climb into a small propeller plane that looks a bit like it was pulled out of a comic strip. The narrow plane, whose interior design seems daring (dirty seats, narrow seats, low ceilings), is your first step into a world that has little in common with Bali’s well-organized, established tourism. The easiest way to get to Flores/Labuan Bajo is clearly the flight. There are currently direct connections from e.g. Denpasar, Bali and Praya, Lombok. But the Komodo airport is also connected to other cities within Indonesia, including Jakarta and Surabaya. For more information on connections and which airlines are available, visit Skyscanner. Also a (very long and exhausting) journey from Bali/Lombok over Sumbawa is possible. The journey starts from East Lombok by ferry to Sumbawa, then to Bima and then on to Sape, where you can catch another ferry to Labuan Bajo. Also, from Lombok you can book a multi-day boat trip to Flores. Very popular is the provider Perama Tours. Arriving at Flores after about 2 hours flight, you can take a cheap taxi to the city of Labuan Bajo (the airport is almost inside the city). You’ll probably be disappointed at first – narrow, dusty streets, hostels and a few scattered restaurants: at first glance Labuan Bajo doesn’t have much to offer. The impression persists. After our arrival at the nice Danke Lodge, which is a little outside the city center, we explored the surroundings by foot. The poverty that characterizes the eastern islands of Indonesia cannot be overseen. Provisional huts and a sparse infrastructure dominate the landscape. The population living in Labuan Bajo is predominantly Christian. The fishermen you will meet on the way to the national park are Muslim though (they originally originated from other islands). 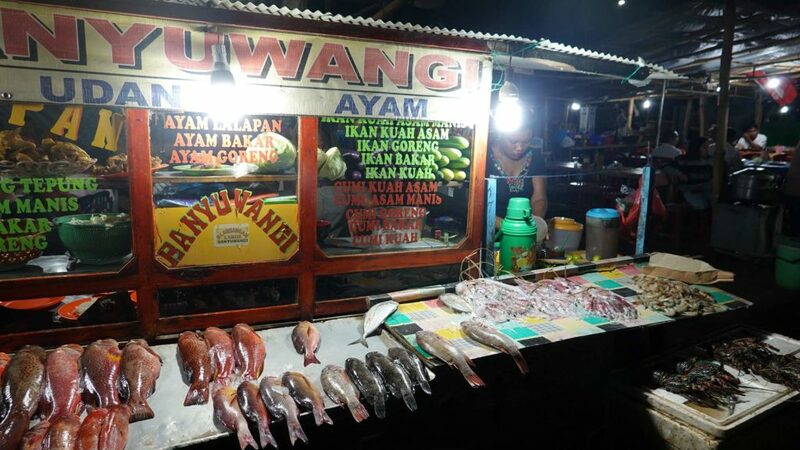 Keyword fishermen: Don’t miss the night market (Pasar Malam) in the center of Labuan Bajo (every local knows the way to get there), where you can get fresh fish, shrimps, lobsters, mussels and other delicacies at a very reasonable price. 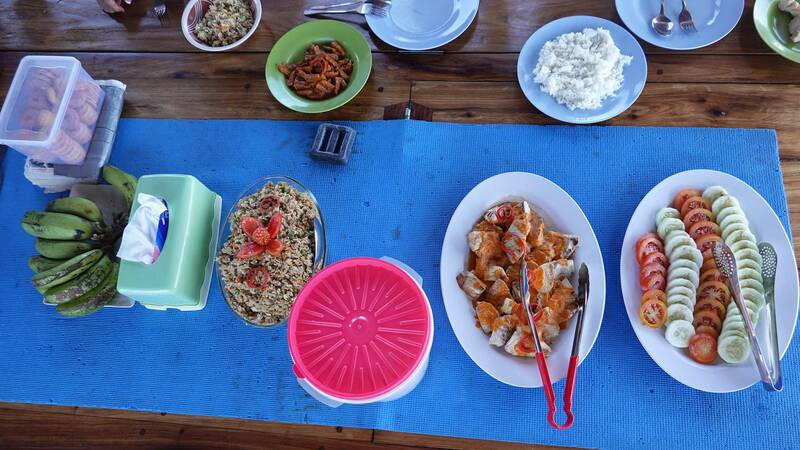 The chefs only speak Indonesian, but they certainly understand what they can whip up for you. Just point your finger at it! The night market is not only visited by tourists, but also by many locals – a sign that the food should be good! After a restless night in the guesthouse (the prices in Labuan Bajo are approx. 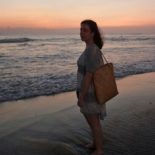 50% above the level of southern Bali, depending on the season) we set off to “check in” at our tour operator. We booked our tour in advance (after extensive TripAdvisor research). We decided on Wunderpus Liveaboard. In the office our wet suits, snorkels and fins were fitted and we had to pay (in addition to the price for the tour) various national park fees. These added up to 20 EUR (conversion rate January 2019) per day. The fees are requested by the government and often changed/raised. 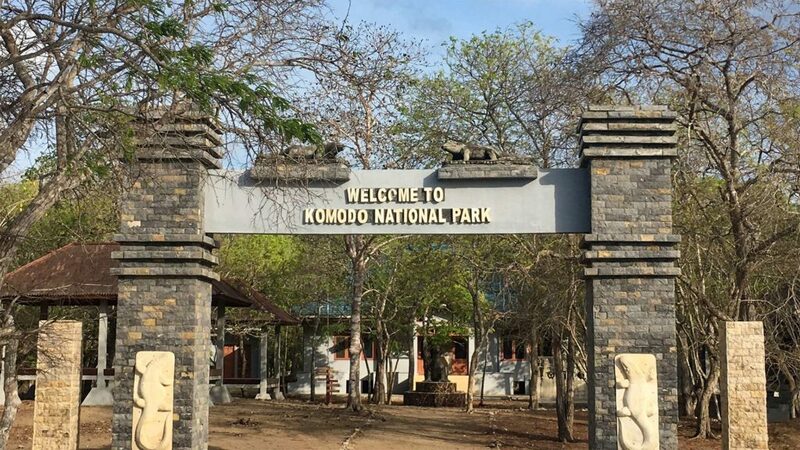 Recently the Jakarta Post printed a statement of the governor of the region: He is planning to raise the entrance fees for the Komodo National Park to a hefty 500 USD (no kidding) per day. So far, so startling. The start of our tour the next day was scheduled for seven o’clock, where we would meet our 5 international companions at the pier. There we were taken to our boat, the “Mimic”. A former traditional fishing boat on which we were permitted to spend the next 3 days and 2 nights. The actual Komodo National Park is a 3-4 hours boat ride from Labuan Bajo harbour. The trip there is depending on the season (we were on the way in November) nothing for the faint of heart (and stomach). However, you will be rewarded with a panorama (above and below the water!) that is second to none. Our first mooring point was Padar Island – an island that is only populated by (according to the guide’s statement) “few” Komodo dragons and their main dish, deer. 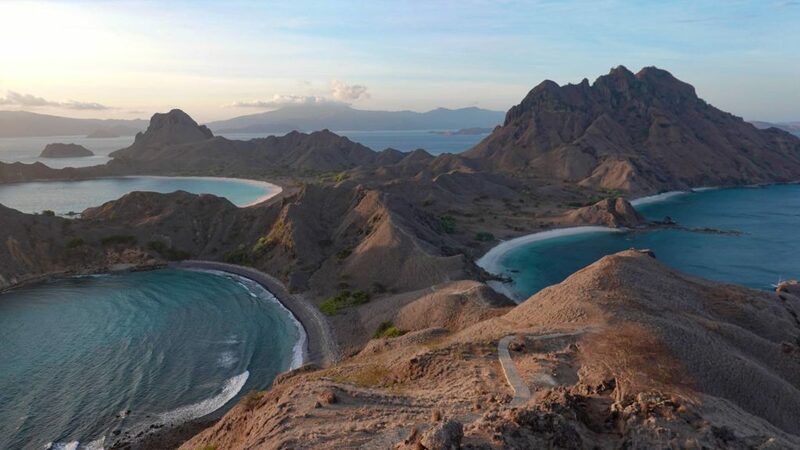 The reason why you should climb the sweaty steep steps up to the summit of Padar Island is the amazing view of 3 beaches in different colours: white, pink and black. The guides made sure that we, the various Chinese tour groups and a few backpackers reached the summit in time for sunset. This view is hard to surpass and unparalleled: gold, white, pink, black and blue are merging into each other and are creating a magnificent view of the bay. It’s worth the climb! Our night on the boat turned out to be interesting: all 6 guests slept on the upper deck, protected from rain by a canopy. However, it was open to the sides, which led to everyone waking up with the sunrise and getting ready for stacks of Banana Pancakes with Nutella, which were prepared in the small galley. A delicious and necessary invigoration for the next stage: snorkeling with the manta rays. So we jumped into the water, looked down and after a few seconds they hovered up: magical creatures that moved as if they were flying through the water. Imagine, these animals have a wingspan of up to 6 meters! 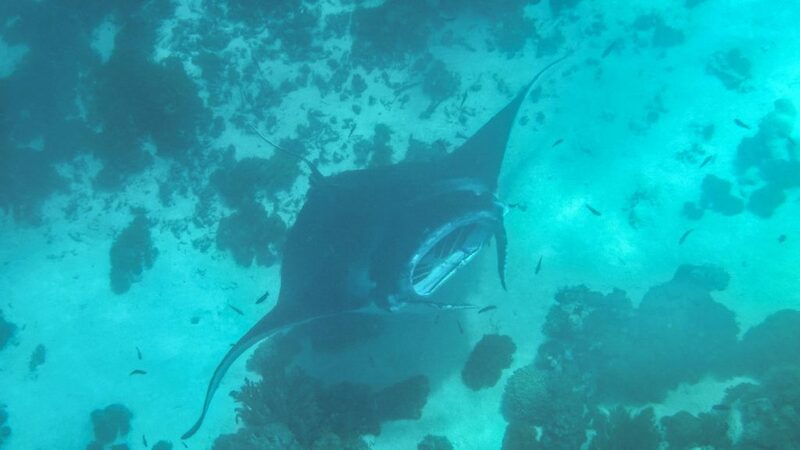 More and more manta rays joined in. The spot was a so-called cleaning station, where the rays lingered to be cleaned by smaller fish of parasites, fungi and dirt. A washing facility so to speak and a beautiful display of nature of which we just couldn’t get enough. 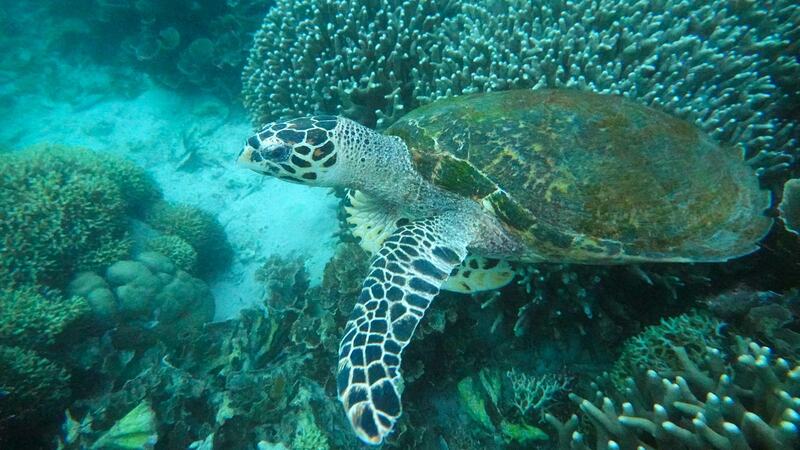 For snorkeling (for diving this is a given) I recommend that you also wear a wet suit, as it gets a bit cold in the water (even in the tropics) when waiting for rays, turtles and other marine life. During our trip we saw manta rays, turtles or reef sharks (black- and white tip) at almost every single snorkeling and diving stop. The biodiversity of this beautiful place literally takes your breath away. 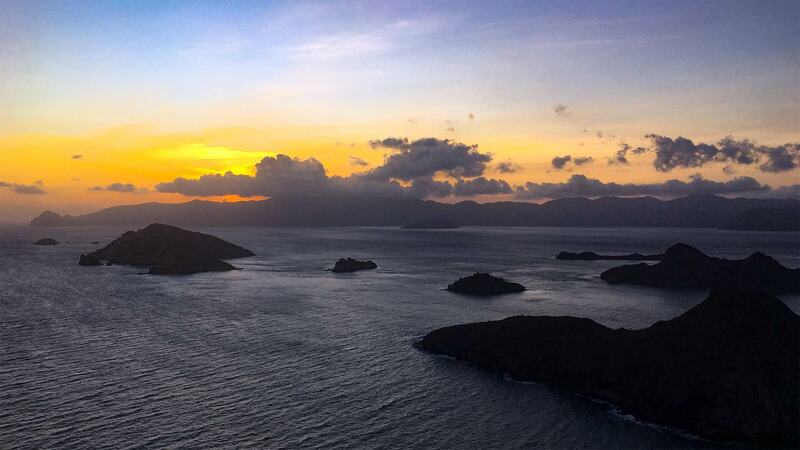 On the next day we finally headed to the eponymous island of the park: Komodo Island. Komodo belongs to the driest places of the Indonesian archipelago. This can be observed in the vegetation, which impresses with its rather rough charm dominated by sand, dust and bone-colored tree trunks. 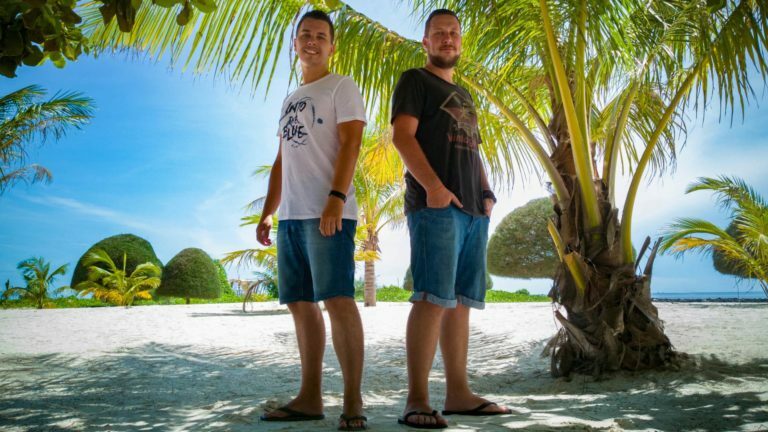 When we arrived on the island, we were warmly welcomed by the local rangers and were allowed to choose between different footpaths across the island, which were aptly called “Short Trek”, “Medium Trek” and “Long Trek”. We took the medium one and it took us a little more than an hour. Each group was accompanied by at least 2 rangers, one walking in front and one behind, each equipped with a stick. Walking around the island by yourself is not permitted (and not smart). 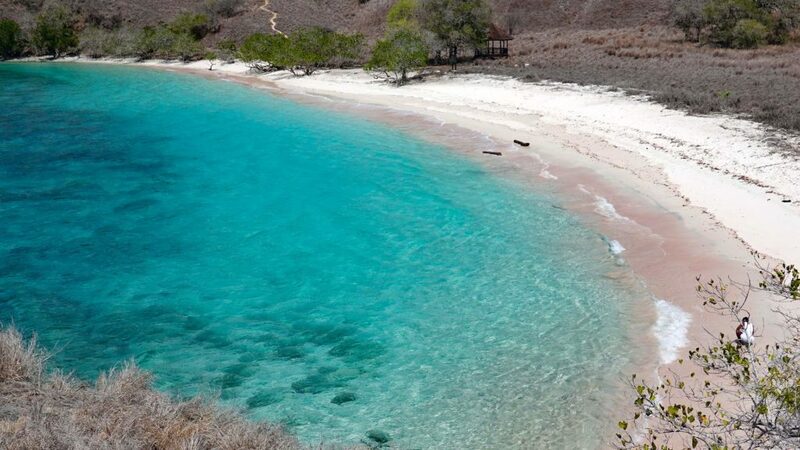 If you decide to go on a trek on Komodo (which can almost only be booked in conjunction with a snorkeling and diving safari), stock up on sun screen, mosquito spray and a bottle (not plastic!) of water – the scorching heat of the island shouldn’t be underestimated. After quite a short time we could already see the first Komodo dragons moving slowly but steadily (they can run up to 20 km/h fast if they want) across the hot sand. Imagine them like mini dinosaurs. With their split tongue they are able to capture smells in the air, so it’s constantly in action, moving back and forth similar to the tongue of a snake. The guide told us that Komodo dragons only eat about once a month; it takes them about 15-20 minutes to devour a goat or deer. As digestion and decomposition of their meal takes a long time, the lizards lie in the sun after a meal to speed up digestion. If they would not do so, the prey would rot in the belly of the dragon and poison it from the inside. Most of the lizards we saw moved back and forth in the sun quite leisurely. The dragons weigh an average of 70 kg and are considered an endangered species; they can only be found on Komodo, Rinca and Padar. 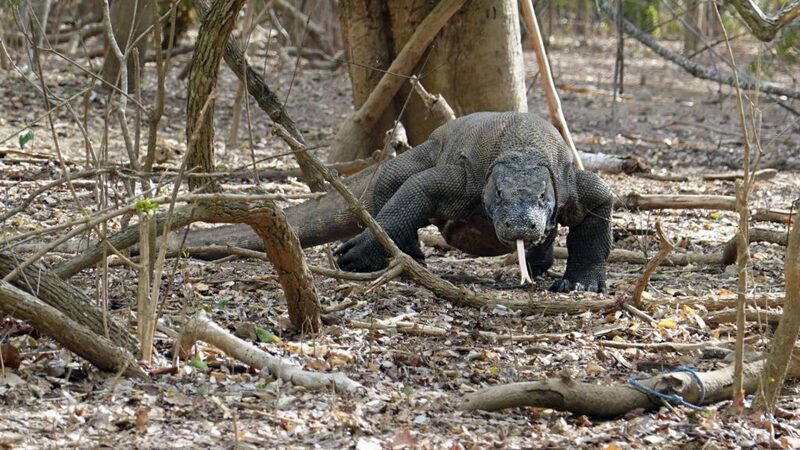 Komodo dragons are cannibals – and also like to eat their children! These rescue themselves by spending the first couple of years of their lives mainly on trees. There have been some incidents involving humans and lizards, so staying on the paths and following the rangers increases your chance of not becoming a dragon snack. Despite these somewhat intimidating facts, I strongly recommend that you go and visit these prehistoric looking animals. With your visit, you are also helping to maintain the National Park and preserve many rare species of fauna and flora threatened by extinction. 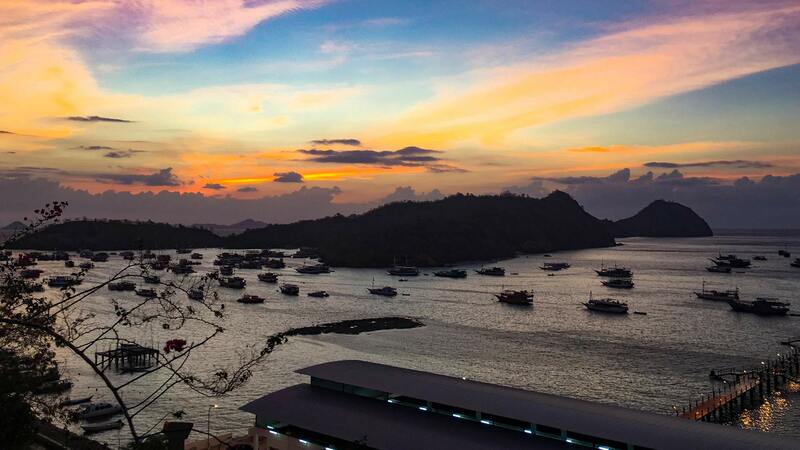 After the arrival by boat in Labuan Bajo on the third day we enjoyed a pizza in La Cucina – a restaurant with Italian home cooking popular amongst both Italians and other tourists with its beautiful view of the harbour and the illuminated ships. Here you can relax and finish your trip, share adventure stories with other travelers or just eat a pizza. A trip to Komodo is certainly not a comfortable trip to leisure and lounge – but an adventure to marvel, sweat, experience and discover unforgettable sunsets, strange primeval animals, elegant manta rays and feel the salt on your skin. 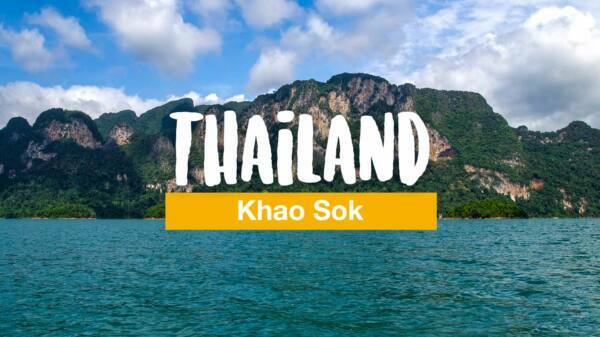 Visit as long as the admission is still reasonable and the islands are not overrun with tourists yet – it’s worth it! Have you ever been to Komodo National Park? 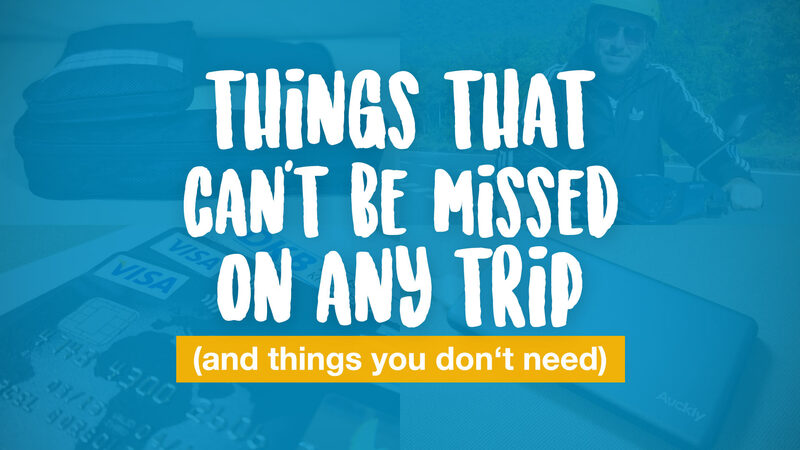 If so, tell us about your trip in the comments.